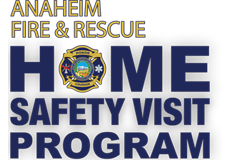 We’ve launched the Home Safety Visit Program, a new Community Risk Reduction program, where fire personnel delivers fire safety education directly to Anaheim homeowners particularly those households most vulnerable to fire and fire injuries. We’ll also provide key information on home fire safety plans, inspect smoke alarms and when needed replace and install new ones. Canyon Fire 2 update 7 a.m.